This is probably one of my most used creations and I have gotten the best feedback on it from people who I have gifted it to. It is perfect for dry winter skin or for people who tend to scratch the skin off their legs while sleeping(I’m guilty of that one myself). It’s great for morning showers, the smell of coffee and caffeine absorbing into the skin is soothing and refreshing at the same time. For this recipe the amount of oil vs sugar can be played with… find what works best for you. I prefer enough coconut oil that it is the consistency of a thick lotion. Heat coconut oil just until it becomes a liquid, add all ingredients and mix well. Pour into a clean container with an air tight lid. Enjoy thoroughly. Heat coconut oil just until it becomes a liquid, add all ingredients and mix well. Seal in container and let sit for a few days to a week for the coffee to work its way through the coconut oil. I made my way down to the herbal supply store, I haven’t lived here long (just over a year) so I googled what I needed and found a place called Herban Wellness( near an awesome thai place) and it was absolutely wonderful, they had everything I needed for this project and then some… so I ended up buying stuff for crafts I hadn’t even thought of making. I wanted to focus mostly on my feet so I automatically thought of tea tree. It is naturally antimicrobial and can combat athletes foot on top of smelling wonderful. I also picked up dried lavender flowers and dried eucalyptus leaf and some natural food dye while I was there. I recommend reading about any essential oils you pick up before using them. Tea tree is toxic when ingested, and although rare, some people can have allergic reactions to tea tree. Concentrations of tea tree oil at 10% or more is not recommended as it may irritate skin. You only need 5 – 8 drops of tea tree oil for a large mixing bowl full of salt. Studies on tea tree oil show that it is indeed antimicrobial and has some effect in treating athletes foot, can kill MRSA in laboratory settings, and 5% solutions have shown some effect at eliminating mild to moderate acne. Measuring: When I measure this recipe I generally pour plain salt into the containers in which it will be stored in when I am finished … in this case I wanted to fill four 8 oz jars. After filling the jars I then dump them into the mixing bowl. ( additionally you can fill the same jar for each container of the same size you will be using. You’ll have just the right amount when you are done. I then added a tablespoon of dried lavender flowers and crushed eucalyptus leaf. You don’t need much and you may exclude it all together. I personally don’t mind flowers and herbs (or tea) in my water. I dropped in about 8 drops of tea tree oil and 1 drop of food dye(for appearance) or instead you can get specialty salts like pink Himalayan salt. Mix well and you’re done! Place the salt in containers, decorate and label as you wish. For a second batch I followed the same routine and used pink grapefruit and bergamot essential oil. I also cut open and dumped in a bag of lemon zinger tea. You can create your own scents though tea tree, rosemary, peppermint, eucalyptus and lavender are all great for feet. For a foot bath I like to have particulate leaves or herbs mixed in, if you are taking a full bath however, particulate may be undesirable, I make an exception for dried flowers, if you have fresh roses about though, a special scented bath with your bath salts and fresh rose petals may be in order as soon as they begin to wilt and droop. Dry your rose petals and they can be added to your foot soaks. Also the amount of essential oil needed will be dependent on the kind you are using, the tea tree is very strong where the grapefruit and bergamot I picked up were more delicate, you may need to use more. 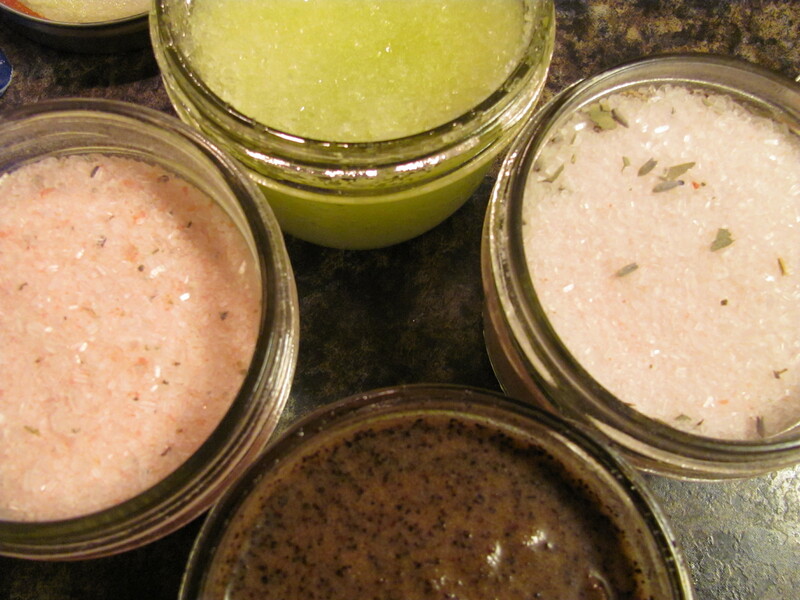 For salt scrubs you follow exactly the same process as above. Excluding any particulates. 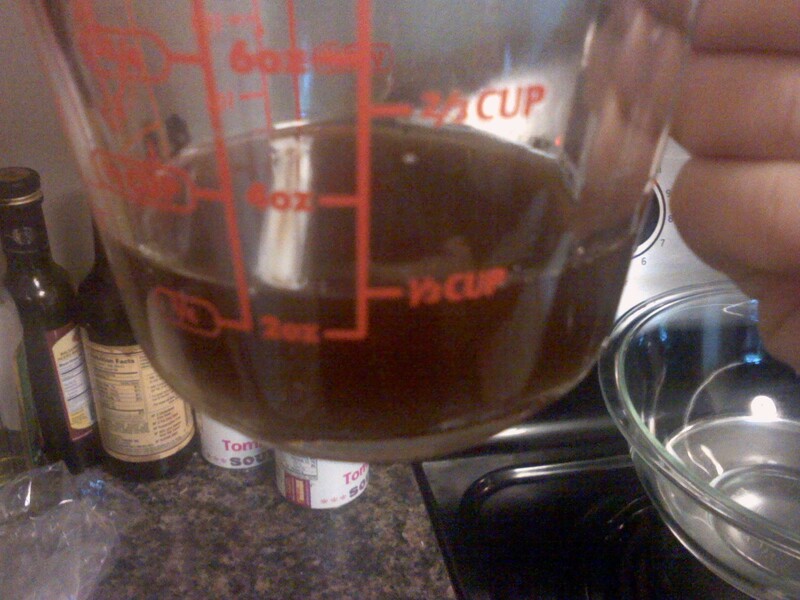 Add oil of your choice to the container until it fully saturates the salt and covers a bit over the top. I got a little impatient with letting my coffee oil infuse so I stole 1/3 of a cup(leaving the rest to infuse for another few weeks) and made some coffee infused body butter. After that I had my double boiler set up and added equal parts of cocoa butter, shea butter and almond oil to my infused coconut oil. I listened to some music and drank some hard cider while I waited for the cocoa butter to melt in. After it is all melted and mixed I rested the bowl in the fridge until the edges start to significantly cool and harden it is time for the mixing. This can take 30-45 minutes generally, depending on your equipment and quantity. Really you want an electric mixer and go ahead and whip the body butter for about 8-10 minutes, if you are a crazy person with no electric mixer just whisk it till your arm is going to drop off. When it is all cooled and whipped pour the body butter into your chosen container. 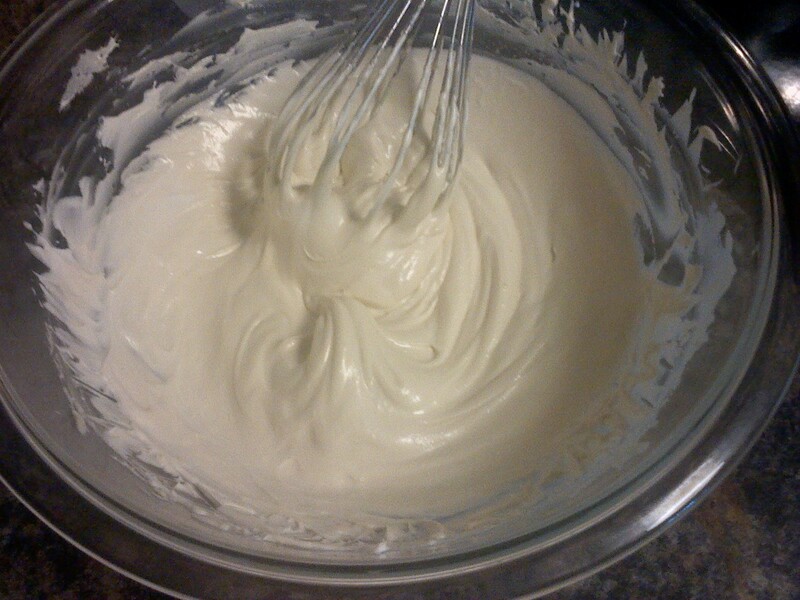 The mixture will continue to stiffen after you stop whipping so get it into a container instead of letting it rest.